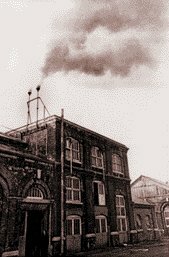 When the Swindon Railway Works hooter blew for the last time at 4.30pm on 26 March 1986, it was greeted in the town as a fittingly mournful symbol of the bitter closure of the factory. For many Swindonians the fact that the hooter would not be heard again suddenly brought home the realisation that the historic works were dead. For over a century the hooter had been part of everyday life and it was sadly missed - even though for many it symbolised the oppressive control that the factory had over people's lives. The twin brass domes of the hooter can still be seen, close to the entrance to the Great Western Designer Outlet Village (pictured, above), but it can no longer be heard. The hooter has subsequently passed into local legend. Like all good legends, the facts have sometimes been blurred by exageration and claims that the hooter could be heard up to 25 miles away have to be taken with a pinch of salt, but it was could certainly be heard loud and clear at Lydiard House, three miles away. It was there that the 5th Viscount Bolingbroke complained that the hooter would disturb the pheasants nesting on his land - and received the wrath of thousands of Swindonians for doing so. In his book, Swindon: Reminiscences, Notes and Relics of Ye Old Wiltshire Towne, William Morris who talks about the "all-supreme interests" of the landed gentry, continues: "Perhaps the feeling... was best of all exemplified in recent times by Lord Bolingbroke, when he set up some senitmental personal grievance of his own against the convenience of some five or six thousand working men: when he objected to the use of a steam whistle for calling the thousands of workmen to their labours on the grounds that its noise might possibly frighten and disturb a few of his pheasants sitting on their eggs a few miles off." A later book, Frederick Large's A Swindon Retrospect: 1855-1930 also recalls the controversy. Large wrote: "So bitter were the GWR employees and hundreds of others not employed in the Works, that a petition miles in length (it was said at the time) was signed and sent to the proper quarter objecting to his Lordship's action, which had the desired effect. The 'Hooter' is still blowing! Long may it continue." 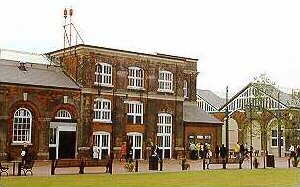 The first means of summoning the workers to the factory had been a large bell, fixed to the roof of 'C' Shed. By 1867, however, Swindon had grown and many of its workers lived in outlying villages, too far away to hear the bell. The solution was a deafening hooter that could be heard several miles away and as it would blow for ten whole minutes at 5.20am was unpopular with many more people besides Viscount Bolingbroke. The Local Government Board eventually ordered that it must not blow again and the GWR's reaction was to install a new hooter - a louder one. From then however, until its final breath, the hooter sounded only a matter of seconds at a time to a carefully orchestrated timetable. 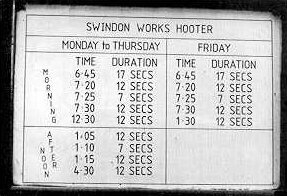 Two or three generations of Swindonians grew up knowing that a 17-second blast of the hooter meant it was 6.45am, another 12 seconds signified it was 7.20am, seven more seconds told workers it was 7.25am and if they weren't inside the works when they heard another 12-second blast it was 7.30am and they were late. The hooter also sounded at lunchtime and at the end of the working day, again to a strict timetable, measured to the second. There were notable exceptions. Ten blasts heralded the beginning of the First World War in 1914 and it was also sounded nearly a thousand times during the Second World War to warn the town of approaching enemy aircraft. Though the length of the blast varied, otherwise the hooter always sounded the same. For the first few seconds it would build up a head of steam, develop into a hollow, low growl and then explode in a high-pitched scream. "There is really only one hooter," proclaimed the staff magazine in 1960. "Other local industries have whistles, sirens... some even boast hooters of their own; but their puny pipings bear no comparison with the full-throated bellow of the Works hooter carried on a westerly gale. Swindon would not be the same without the old hooter's clarion call." Inside the works, though, the hooter had its impersonators. The most famous was George French who imitated the noise by blowing through a piece of gas pipe and he was quickly given the nickname 'Hooty'. Ironically, he was dismissed from the factory for bad timekeeping and took to selling hand-held windmills, sadly dying in the local Workhouse at the age of 65 in 1906 - and still known by everybody as Hooty. But the hooter has provided much happier memories for Swindon people, including Eric R Mountford, author of Swindon GWR Reminiscences. He recalled how the final warning hooter caused men to speed up their walk to work on hearing it. Then came the final blast "with the late comers scrambling to take their numbered brass time checks (pictured, right) off the hooks on the check board before the sound stopped, as once it did the glass front on the check board was pulled down. Anyone who missed removing his check even by a few seconds had to wait for half an hour, after which the board would be re-opened, and a half hour check put on the hook to replace the time check. Besides losing half an hour's pay, a second re-occurrence of this would usually mean a message to report to the office later, and explain." He concludes: "The sound of the hooter was a daily feature of the town; life was controlled by it, clocks and watches adjusted by it, and meals got out of the oven and dished up in readiness for the menfolk when it blew. It was a small but important part of the life of the town." Today there is still one way to hear the hooter. Swindon pop group XTC immortalised it in their 1986 single, "The Meeting Place". The hooter was the inspiration behind the song, and its unmistakable tones form the introduction to it. Rex Barnett - a bloody good bloke!